Ink Fingerprinting in San Diego: Law Enforcement Approved! Fingerprint Technician Certified by Department of Justice. San Diego Sheriff & Police Station Authorized Alternative. Expert Ink Fingerprinter – Quality Fingerprints Guaranteed. Fingerprinting Rolling Fee is Only $18.00! FBI FD-258 & SF-87 Ink Card Fingerprint Service. (New)* FBI Channeler – Expedited FBI Reports! FBI “National” Criminal Background History Checks. NEW – Now Open Monday – Saturday 10am – 3pm! San Diego Mobile Fingerprint Services. Alive Scan is certified by the California Department of Justice (DOJ) to finger print via Live Scan (digital), FBI FD-258 Ink Cards and the SF-87 Ink Fingerprint Card. Applicants needing an FBI level criminal background check MUST be fingerprinted by a certified fingerprint specialist who signs, dates and enters their official FPC authorization number. Alive Scan is San Diego’s trusted source for ink fingerprinting. Alive Scan is proud to announce that we are now offering FBI Channeler Services at our San Diego location. Applicants can now electronically submit for an FBI Criminal Background Check or Police Clearance and receive the report usually within 24 hours. This expedited service reduces the time it takes to receive the FBI Identity History Summary Check by months in most cases. The FBI Channeling Service is very common for Traveling and often required to meet VISA requirements to study abroad or work over-seas. Please visit our FBI Channeling webpage for more information. California police departments and sheriff offices no longer offer ink fingerprinting to the general public. Many of our applicants are originally instructed to go to their local police station or sheriff office to be fingerprinted. However, California law enforcement migrated away from providing a fingerprint service to the public in 2005. Alive Scan is now San Diego’s trusted alternative for live scan fingerprinting. 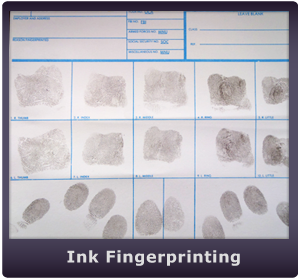 Ink Fingerprinting is typically required for out-of-state and out-of-country purposes. The livescan fingerprinting can be used to check your criminal history file at the California “State Level”. However, in order to process your “National Level” criminal history summary, you MUST submit an FD-258 ink fingerprint card to the FBI CJIS Division. NOTE: Alive Scan is proud to announce that we can now electronically expedite FBI criminal background reports as an approved FBI Channeler. Security Clearance Letters & FBI Criminal History Reports. Identity History Summary – AKA History Summary Request or Rap Sheet. People often find it difficult to obtain the required blue FBI FD 258 fingerprint card (aka Ten Print, Ink Card, Hard Card, Blue Card, Wet Fingerprints, Hard Copy…). Fortunately, Alive Scan provides these fingerprint cards “FREE” to our customers! However if you do require a blank fingerprint card, you can purchase them for $5.00 each. Alive Scan is authorized for the FD-258 Ink Card Fingerprinting, which is required for the DOD CAC (common access card). The CAC, a “smart” card about the size of a credit card, is the standard identification for active duty uniformed service personnel, Selected Reserve, DoD civilian employees, and eligible contractor personnel. It is also the principal card used to enable physical access to buildings and controlled spaces, and it provides access to DoD computer networks and systems. For more information please see DOD Common Access Card website. Alive Scan strives to capture the best quality fingerprints possible. Our success rate is very high. Occasionally, fingerprint cards get rejected because of low quality images. This is usually due to age. Although our fingerprint patterns never change, the ridge lines do get “worn down” as we age. Our fingerprint expert takes great pride in consistenly producing the best possible prints. In fact we guarantee it! If your fingerprints are ever rejected due to poor quality prints, we will reprint at no charge.